on Cannery Row is one of those attractions that adults are just as excited to see as the kids. Not only can you and the fam enjoy the underwater sights, but you can witness lunchtime for the sea otters and at the Open Sea exhibit. The kids won&apos;t even complain about education on habitat that the staff sneaks in between the "oohs" and "aahs" of watching sharks chow down. Parents love the onsite dining options, perfect for snacks or a family meal. If you&apos;ve got a whole weekend free, consider the Aquarium&apos;s Seashore Sleepovers. Well, only if you&apos;re ready to make all future sleepovers look really lame in comparison. Cafe Rustica&apos;s stone pizza oven puts a delicious spin on every kid&apos;s favorite food. The Cubs&apos; Menu at Black Bear Diner has some tasty options for breakfast - hello, Pancake Volcano - and some surprisingly gourmet kid dinners, all part of the Kids LiveWell program. Don&apos;t forget, you can always hit up old favorites like Johnny Rockets and Bubba Gump Shrimp on Cannery Row. 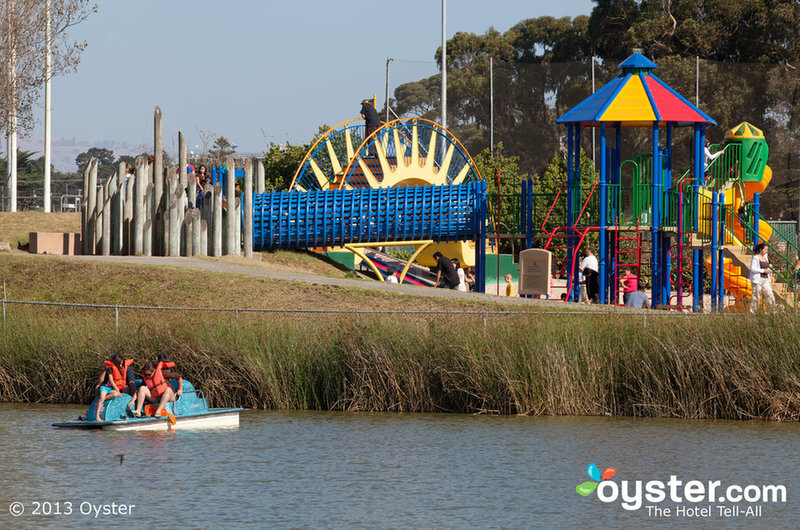 If the little ones need to blow off some steam take them to the Dennis the Menace Playground in El Estero Park Complex. Get your picture taken with the Dennis the Menace statue and then let the kiddos tear through the hedge maze, climb the rock wall and enjoy the giant slides. For the parents there are benches ringing the perimeter and restrooms. Hey, you&apos;re in Monterey, take your pick of beautiful beaches. We&apos;re fans of Carmel Beach in Carmel-by-the-Sea. Not only can you spend your day doing beachy things, you can also stay for the sunset and then light a bonfire. Parents can relive Gidget while the kids get to experience true California beach life. If you want to give the family a beach experience they won&apos;t forget, head to the Pebble Beach Equestrian Center. Let the natural world be their new playground equipment! Choose from beach or forest horseback rides - kids 7 and older - or let the youngsters enjoy life on the back of a pony. MY Museum, the Monterey County Youth Museum, is a great place to take the munchkins. The friendly tagline "Where kids play to learn ... and grown-ups learn to play," says it all. Sneak in a sustainable foods lesson at the My Healthy Farm exhibit that lets kids hop on the tractor and take produce to the Farmer&apos;s Market or Healthy Foods Café. Check out the kid-sized putting green. Try out the life-sized Operation Game at My Hospital. Balance your budget at the play ATM in My Town Hall. No matter how you spend your day in Monterey, your family won&apos;t forget it. Guest Post by Courtney Gordner. Connect with her on Google+!